End of week 9 or day 63’ish. That means only 17 days to go for this round. I’d be lying if I said I wasn’t looking forward to setting new and different goals for round 2. Oh, yes, I’ll be doing round 2. I took a few days off from writing “fresh” words on my WIPs to do mucho editing…of my steampunk ocean short and of the submission I decided to do with that other short I loved so much. I expanded the latter to about 5000 words—beefed up the fights, added some cool critters, a little more romantic tension. I also subscribed to autocrit.com and put it through the paces, zapping trash words, repetitive phrases, cliches, etc. That being said, I DID finally work on Sins. I rewrote the chase scene to cut out the hero altogether and make it 100% up to the heroine to outsmart the bad guy, which she did with aplomb. So, word count did not grow, but that’s ok. I finished my beta read for fellow writer and have about half of my notes transcribed for her. Yay! My cumulative stats are here. 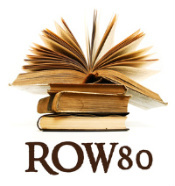 Links to other ROW80 participants’ progress reports is here. Give ’em some love. Thanks, Alberta. As I’ve always said, writing is first and foremost for fun. When new and unexpected opportunities or motivations (or obstacles) come along, there’s nothing wrong with detouring in order to take advantage (or address) of them. Good luck with your goals, whatever they morph into.